Is it necessary to use peat to grow rhododendrons? In part one of my series I happened to mention that some modern seed and potting composts are quite execrable. I promised to discuss the merits of peat and to explain how misinformation has led to public opinion that the use of peat in the garden is an environmental sin. Such a view is fundamentally unsound. Our UK government is of such a nature that anything that suggests that they might be doing something for the environment - provided it is not politically inconvenient - then they will do it; however flawed. Worse the briefs and financial support for horticultural research is always in a framework dictated by scientifically illiterate political masters. Great institutions such as the RHS and the National Trust will jump on any bandwagon as long as it pleases the public and preserves their popularity. Their poor staff must follow management edicts. Many of them too have been sucked in and really believe the nonsense. I cannot hope to reproduce the dissection of this foolish rejection of peat better than how it is brilliantly presented on the Glendoick nursery website. Read it now before you return to my more histrionic comment. I was there at the beginning when certain ecologists began to question the destruction of lowland wetland habitats by peat extraction. I remember a lecture - I think it was David Bellamy before he was famous - who warned about the dangers. He sometimes lectured to our National Parks Conference held every January at Askham Bryan College. Publicity generated by great horticulturists and ecologists such as he has led to excellent legislative safeguards for our lowland peat habitats. I understand now that many insightful people such as David are now appalled at the curious notion that peat use in horticulture might be banned in the UK. Only the UK. The rest of the world is completely ambivalent. There is no shortage of peat. Half of Scotland’s topsoil is peat. The Irish are not short either. There are huge deposits that extend from Sweden to Siberia. Contrary to propaganda that peat is not renewable it in truth propagates itself, albeit slowly. Approved woody materials such as bark, shredded wood and coir scarcely renew overnight! In Sweden peat production is treated as a crop in a similar way to the forests. The earth generates 600 million metric tons of peat each year and 200 million metric cones are extracted. It sounds renewable to me! Only a very small fraction, about 2%, of this peat extraction is for horticulture. Most is used for power stations and things. World authorities including the European Parliament approve peat as a renewable resource in environmental calculations. Why on earth do not we? Lowland wetlands are no longer threatened. Although these sites - and some highland ones too - are places rich in ecological interest and diversity most worldwide peat deposits relative to other land uses are ecologically sterile. Although peat extraction has in the past destroyed English lowland bogs, as far as I know, it happens no more. Actually stripping a layer of peat from very thick deposits does not even have to destroy a bog as a habitat. I would imagine on well managed extractions if the surfaces of some wetlands are actually lowered and there is more free water this is not a bad thing. Although people worry about the destruction of peat wetlands it is important to realise this has in almost all cases arisen by drainage for farming and forestry. Once peat bogs are drained and the natural peat deposits are exposed to oxygen they degrade and release the dreaded carbon dioxide and entrapped methane. Gardeners who regularly cultivate and stir up their soil add far more carbon dioxide to the atmosphere than their minimum cultivator neighbour who uses a little peat based compost for his propagation and pot plants. Somehow propaganda has persuaded the ignorant that peat potting composts are somehow deficient! People even pay a premium to buy peat free. Peculiar economics when folk pay more to buy something grossly inferior. Good and responsible gardeners fear not if you buy compost that does not claim to be ‘peat free’ it will almost certainly contain peat. Thank goodness. The arguments for many products sold as responsible alternatives for peat are just wrong. Take coir ( no thank you). Carted halfway round the world stealing Third World resources and totally distorting their own traditional agricultural practices to their own detriment and our dubious gain. I would not touch it with a bargepole. For peat it looks pretty dire. How can the estimate for green compost be so low? Forty ton lorries deliver organic waste from all over Yorkshire to the recycling plant up the road. Their sophisticated equipment must be energy intensive to manufacture and use. Great tractors whizz by as they search for places to dump the damned stuff on accepting farmers. The figures might be close for your own compost heap - but for the commercial product.....? But why is the figure for peat so high. The end of life figure confuses me. I know peat is almost pure carbon but so are the other materials too (well not the perlite and vermiculite!). In my own experience peat actually lasts as a compost a rather a long time. Far longer than green waste compost that is gone in the proverbial flash. Is there no credit for low rate of decay? But that huge figure. Out of proportion to all the other totals. Why? It then hit me they don’t count the CO2 produced by the other organic materials. They are considered renewables! All those damning figures at the stroke of a devious pen! It does not seem to matter that the rest of the world considers peat a renewable resource. If you strip out this figure and one that recognises you do get a degree of carbon storage, you get a respectable 183kg. Even this latter figure is distorted by the huge estimate of transport. Why does the transport of peat cost so much more than that of compost or bark? Clearly if you use vermiculite or perlite in your compost you are very naughty indeed. It contains no carbon but its enormous carbon footprint comes from the huge energy costs of exfoliation of these minerals. There are lies, damned lies and politician’s statistics. The main factor is that when fully wetted it retains very high levels of both water and air. It can be granulated to make a very uniform compost ingredient graded to sizes for multiple uses. Peat based composts when made to precise formulae are the same very time. It holds on to nutrients quite well and better than most alternatives. It is free of weed, pest and disease and does not need sterilisation to make it so. It is acid and suitable for acid loving plants. For such as rhododendrons incomparably so. With appropriate amounts of ground chalk or limestone it can give any pH a gardener might desire. One thing I don’t miss about peat - regular readers will know I make my own soil compost - is the watering. It is hydrophobic when dry. Water just runs through. It is not alone in this very inconvenient waste of water but with peat the effect is particularly marked. When I buy a container grown plant I usually soak it in a tank of water to bubble it wet. Retail staff would scarcely win watering diplomas. It is quite a paradox really. Peat based composts when fully wetted hold much more water than any other compost and yet you seem to be watering all the time. Gardeners just don’t get watering of peat compost. Many professionals neither. Taught on their mothers knee to let compost get dry before you water it again, with peat this strategy is wrong. Not only does dry peat repel water it slightly shrinks and water runs through. In this hydrophobic state it is difficult to fully rewet and a vicious circle of frequent re-watering commences. In very hot weather even for the most diligent this is likely to happen. The way to water peat compost is to re-water when it is still quite wet. It will usually take several days after watering a plant in before you need to water and it will go longer between waterings than a soil based John Innes compost. But don’t let this time go too far. If it gets too dry you are soon chasing your tail. Although I don’t now use peat composts myself because - almost uniquely - Seaton Ross soil is suitable for making my own soil compost, I used peat compost in my previous home for nye on thirty years. I would like to make a few suggestions based on my experiences. To read some of the gardening press you might think that you needed a lot of individual composts to suit the requirements of different plants. In reality it is not necessary to buy special mixes for every new plant. The requirement to use special compost is much less frequent than you might suppose and for most plants a very limited range of compost will do. To satisfy special needs you can amend compost yourself. I never used to buy my peat in bales. My friend Peter Williams does because he wants to make up fairly coarse mixes for his wonderful rhododendrons. 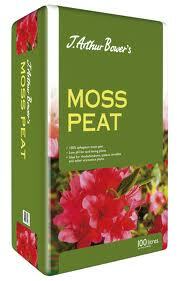 (You will fail to propagate really good rhodos without peat!). I preferred to buy my peat already mixed as ‘multipurpose peat compost’ appropriately granulated in eighty litre bags. Multipurpose compost is very weak in nutrients and has very few weeks supply. That’s what made it so good to sow all of my container grown seeds and propagate all of my indoor cuttings (If you use a mist propagation unit as does Peter you might prefer half perlite or grit mixed with granulated unenriched peat). Certain plants such as tomatoes need far more nutrients than slow growing plants such as cyclamen. Large plants in general like a much richer compost than small ones. There might be seasonal variation in plant nutrient need. Mixing in slow release fertiliser before potting. This is sometimes packaged for this purpose. I still have some of my stock of coated slow release granules. In my day it was marketed as ‘osmocote’ but now that the working principle is ‘out of patent’ there are many very suitable versions. Liquid feeding is the most successful and popular way to adjust nutrient levels as your plants grow. An alternative to liquid feeding - in general for coarser and maturer plants such as specimens in tubs - is to occasionally ‘top dress’ with a good general fertiliser and let rain and irrigation wash it in. We used to take the students to a see how peat is extracted and how loam-less compost was made. We noticed that the professional composts they mixed were fertiliser enriched 100% peat - and looked like that too. The amateur versions had little white and pink bits adorning it. I think the white bits were perlite - a useful material grossly overused in my opinion by many amateur gardeners. We asked our guide about this. His answer was ‘purely cosmetic’. Amateurs, he suggested, like to buy what they perceive as little packages of technology. If they didn’t colour the compost some people would think it was only peat. Those were the early days of loam-less peat composts. How things have changed. Now anything brown - however inappropriate - seen in a garden centre is assumed to be seed or potting compost. I don’t usually approve. Arguably used in this way it is a waste of a valuable resource. Many gardeners use it in such a manner that it is positively harmful. Just the same as they use peat substitutes too! That is not to deny that its water holding capacity, aeration and distinct acidity if properly utilised is invaluable. Despite peat’s reviled credentials as being biodegradable and releasing carbon dioxide its rate of decay is really rather slow. In comparison with my heap from the waste cycling site that has almost oxidised away in a year it is almost long lasting. Legitimate uses of peat as a soil additive might include creating an acid bed for such as acid loving alpines. 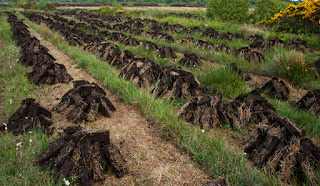 ‘Peat beds’ are usually slightly raised so they do not receive alkaline drainage. These are uses of peat about which I am pretty scathing. Used to pretty up soil surfaces such as brown toppings on graves. Used as a mulch. If wet it is still water absorbant and intercepts valuable rainfall. If hygroscopically dry - its most usual condition - it casts off water away from your plants. Pockets of peat or peat compost around any new planting. Frequently sumps for water on heavy clay soils. Often little pockets of roots that have no escape into surrounding clay. Little graveyards of dryness that do not wet up after drought. Sad little plants ready to be yanked out by a carelessly manoeuvred hose pipe! Generally dumped on an alkaline soil and crudely spaded in. To be of real value it needs to be mixed in - usually in a fairly low proportion. This does not sit well with me as a minimum cultivator. Trying to grow blueberries on an alkaline soil generously laced with peat! I save my real ire for those who plant in thin layers of pure brown stuff - whether it is peat or something new fangled. In answer to the opening caption, it is not necessary to add peat to your soil for rhododendrons if your soil is already acid. Peter Williams’ fine plants only benefited from peat when he propagated them. I have used Peter Williams as an example of a fine ecologist who sparingly uses peat in his garden. As a member of several conservation groups and the man whose research on pit heap restoration enabled the greening of North of England landscapes he has the very best credentials in caring for nature. Peter recently took a student to study the ecology of a reclaimed spoil heap and failed to find it! 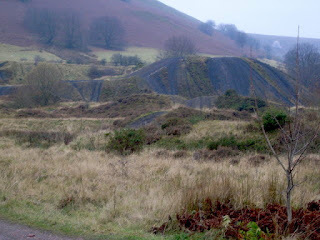 The spoil heap in the picture has not yet fully merged into the wild. I have been down' to Peter's this morning and we have examined the compost at the top of the picture captioned Pete's peat'. The multipurpose compost does not indicate that it is peat free and is either a blend of peat and 'green compost' or just green compost. We could not really tell! On careful examination we found bits of plastic a giveaway that it does contain green compost. Peter uses it to mix with peat for his rhododendrons. I have seen numbers like "The earth generates 600 million metric tons of peat each year and 200 million metric cones are extracted" several times, but have yet to find a reference that would confirm the numbers. if you have a reference, I'd like to see it. I found the part of peat in the UK interesting since I've read several times that the UK and Scandinavia are running out of peat. Core is a waste product in the coconut industry and hence a reason to use it. 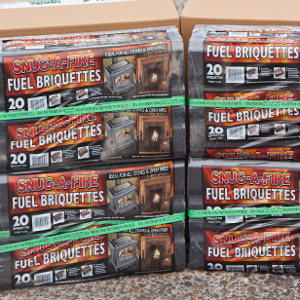 What I have never seen is a calculation of the amount of fuel to package, and ship it to Europe or the US. Thank you for your thoughtful comments Robert. I admire how on your own site you give copious references to your sources. I would like to think the information I give is reliable and try to make clear when I am expressing opinion rather than fact. Far too many statements are made in the gardening media that are unverified and much you read is just plain wrong! I the case you query I have just accepted the figures on the Glendoik site as I deem them an honest and reliable source of information. The fact that you have heard the statistic elsewhere confirms the information is out there. As sphagnum peat is reliably reported in optimum conditions to regenerate at 1mm a year and considering 3% of the earth land and freshwater surface is peat the figure is not unreasonable and I have not seen it challenged by the anti peat-in-the-garden lobby. Unfortunately much of the world’s peat is not in pristine bogs and is being lost to land mismanagement and drainage for farming, forestry and just about every land use you can imagine. As to coir my comment it is based partly on the fact that I do not think that coir composts are very good! I once read a report that the vast heaps of coconut pith residues had now been used up and that coconut production was now being distorted to supply a marketable product. I cannot verify this and indeed if it is true it might not be a bad thing. Coir transport costs for the dehydrated material from India and Sri Lanka are not as bad as you might suppose either and it is suggested that the main transport cost is after rehydration in the UK! There are however serious issues of considerable water usage in drought areas in India and working conditions where workers work very long hours in very dusty conditions. The water is used to flush out the many toxins/impurities in the raw material. There is more information in this reference which can be copied and pasted into google. As you would expect Roger I am wholeheartedly behind the sentiments expressed in your post. Peter's use of peat enhanced multi-purpose compost for growing rhododendrons and azaleas mirrors my method for primulas and meconopsis except that I do add some grit. I no longer watch Gardener's World but my ears pricked up when I heard the word "meconopsis" when switching on the TV recently. Mr Don was planting out what were referred to two year old plants of meconopsis and also showed a pot of small seedlings which were said to be twelve months old, which I assume was from the sowing date. he then went on to say that the soil did not need to be acid, or words to that effect. My meconopsis seedlings sown on the 01/01/2015 are at least the same size as his two year old plants, do you think that might possibly have something to do with the fact that his will be grown in "peat-free" compost? Forgive me if you have already pointed this out but it is important to remember that peat has no nutritional value in itself. The great man has sometimes been known to open his mouth and put his foot in it, Rick. I was once told by a Nottingham grower - not sure if it is true - that Percy Thrower once killed the nation's fish when he recommended clearing pond water with lime!